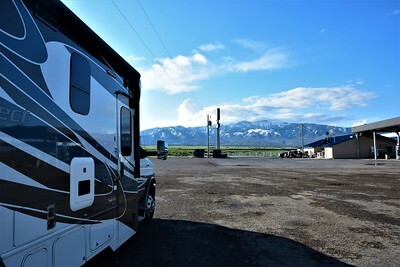 We left the property of our Boondocker's Welcome host in Blackfoot, Idaho around 11:00 and took I-15 north to Idaho Falls where we then got on U.S. 20 north and took it all the way to West Yellowstone. 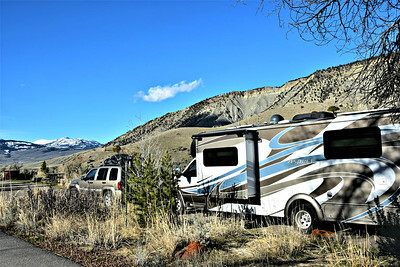 All the RV parks and campgrounds in the West Yellowstone area I knew of were still closed, so I had my eye on three or four free boondocking spots. The farther north we went, it became clear that at least two of those weren't going to be possible due to snow. But my primary choice was the Bill Frome Memorial County Park on Henry Lake. It's a free campground with a boat ramp - dry camping of course. Unfortunately, when we arrived, the road there was still covered in snow. The campsites were clear, but the road just wasn't passable. For a moment I considered getting out my little folding shovel and ..... nah, we'll move on to another plan. 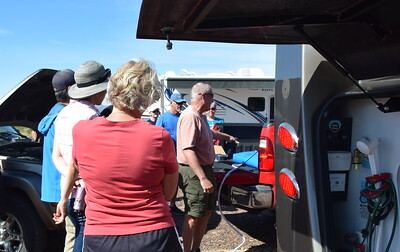 We stopped at one lodge with RV sites, and they wanted $48 for an electric hook-up or $40 for dry camping. Moving on. In West Yellowstone, we found one motel/RV Park that was open. Water and sewer wasn't available, but we could have electric for $50 a night in what may be one of the worst RV parks I've ever seen. Nope. Our intent was to camp close to West Yellowstone so we could visit with our friends Leesa & Gary who would be workamping there. However, their park delayed their arrival due to snow, and they won't be here until after we are gone. 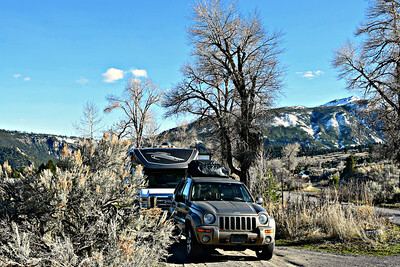 So, we decided to keep going and camp at Mammoth Hot Springs Campground near the north entrance to the park. 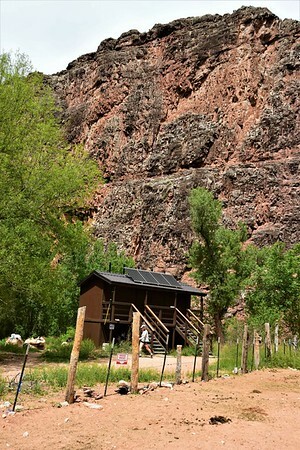 It's the only campground in the National Park that is open year round and is currently open. 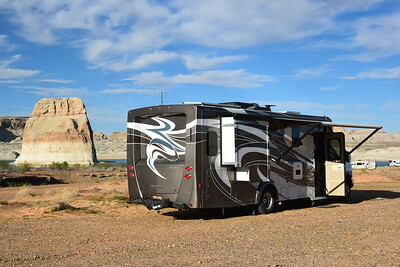 We had camped there with our big fifth wheel in the past, so we knew we would fit. The west entrance road just opened this past Friday, and we knew we could get all the way to Mammoth, so we entered the park around 4:00, and I figured it would take about an hour and a half to go the 50 miles to Mammoth Hot Springs due to lower speed limits and road construction. Not far into the park, we stopped for my first photo. It's sort of "mud season" as the snow is melting, and the landscape isn't pretty in most places, but there are exceptions like the photo above. 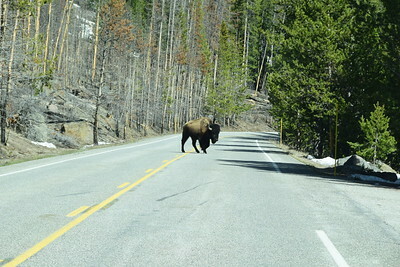 Shortly after that, we had our first Bison in the road. 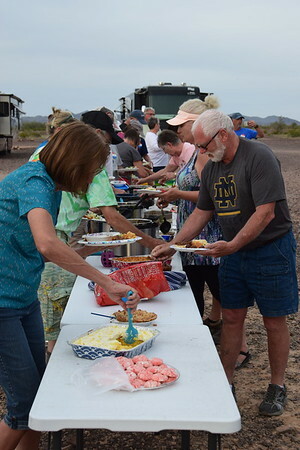 Many of the side roads and picnic areas were still closed as we made it to Madison Junction and then continued north. 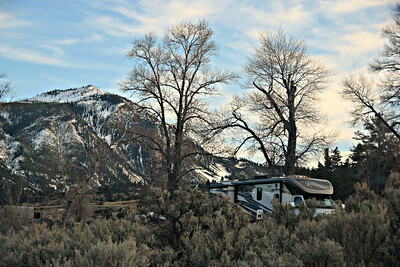 After a lengthy construction delay, we had this view a few miles outside Mammoth Hot Springs. 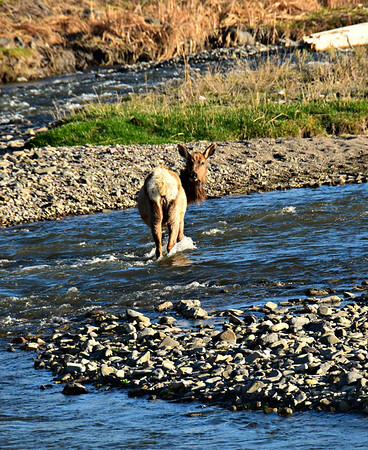 In our past visits to Yellowstone, the little town of Mammoth Hot Springs was a great place to see Elk. 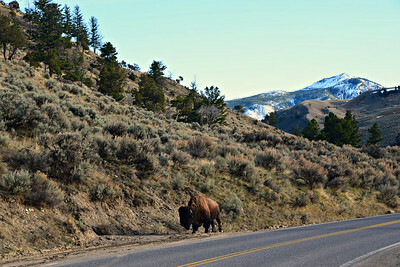 Today, however, there was a small herd of Bison wandering around. We continued through town and made it to the campground. 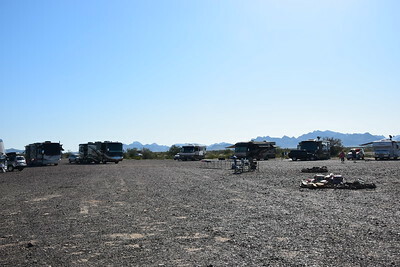 There were plenty of campsites available, and we chose Site 8 which is pretty level, dry, and long enough for the motorhome and Jeep. 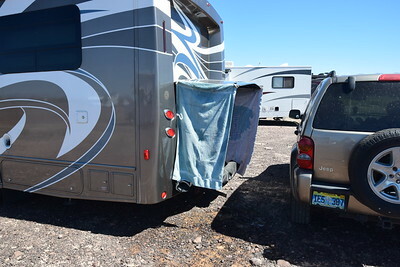 There are no hook-ups, but we came prepared to dry camp and that was no big deal. The water is turned on, so we can fetch water if we need it. At $20 a night, it's double what we paid last time we were here, but given our options, we'll take it. After getting settled, I drove around a little toward the town of Gardner. The first few miles of that five-mile stretch have always been a productive area for spotting wildlife in the past, and it didn't disappoint today. I saw plenty of Elk, some Mule Deer, and a lone Bison that I spent some time with. 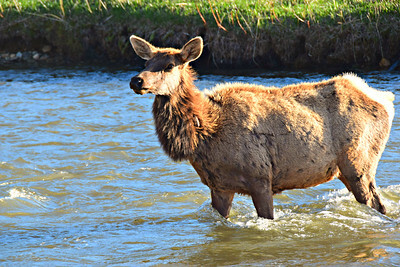 Here are a few Elk photos. That cow crossed the river and crossed the road right in front of my Jeep. I gave her a wide berth. 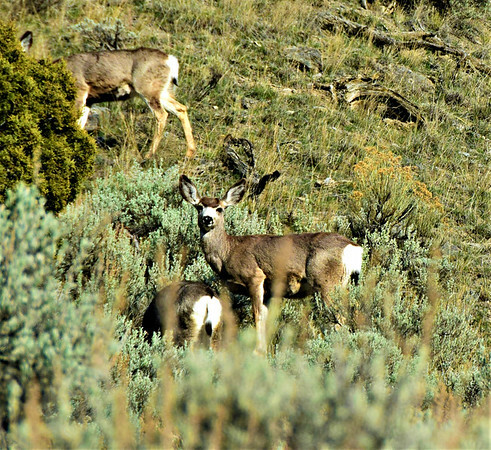 I scanned the hills for Bighorn Sheep as I've seen them there before and it's a "sheep management area". 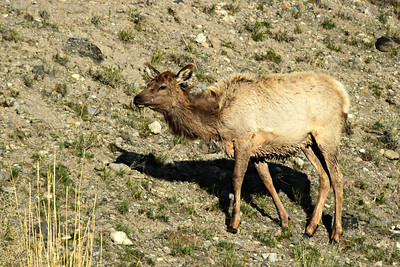 No sheep, but I saw some more distant Elk and a few Mule Deer. 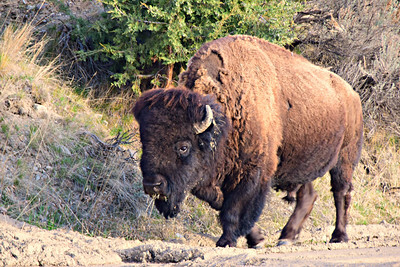 After that, I sat in the Jeep having a little alone time with this Bison. 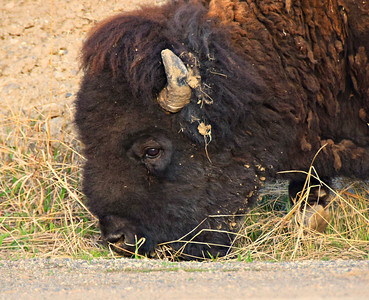 He approached and I could hear him breathing and tearing the grass out. After watching for several minutes, I headed back to the campground where I took this photo of our rig from a different angle. 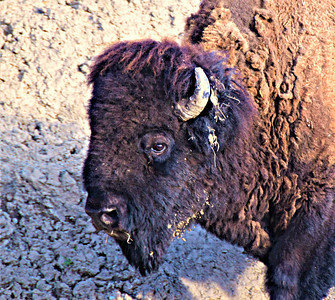 Rather than stopping, I drove back into Mammoth Hot Springs where I watched the small herd of bison for a couple minutes before driving out toward the northeast entrance for a few miles looking for more wildlife. I saw more distant Elk, but nothing else. 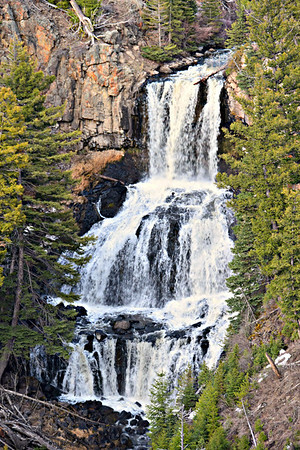 I pulled over to turn around at the Undine Falls parking area. I went ahead and got a photo while I was there. And with that, I drove back to the campground. Linda made us some pasta, we relaxed and called it a night. Having never been to Yellowstone this time of year, I had no idea what to expect. Though much of the park is still closed, we're off to a pretty good start. We'll see what else may be in store for us the next couple of days. Well, the last month has flown by. Here's a summary of what we've been up to. We wintered in one place (a rarity for us) from December 1 until the last week of March. Our friends Don & Deb are Asst. 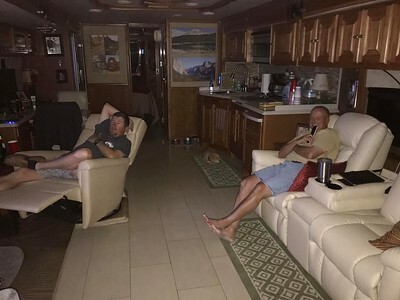 Managers at Butterfield RV Resort in Benson, and we couldn't resist their invitation to stay with them. 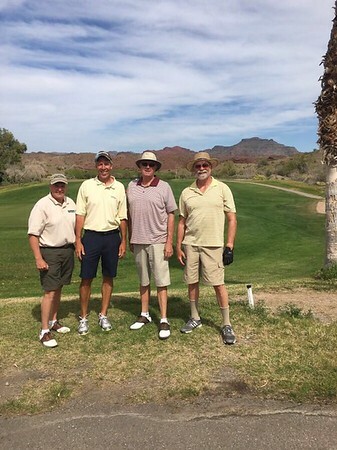 Linda got involved in the social aspects, and I enjoyed golf and, by the end, almost daily pickleball. And we had several game nights with friends. 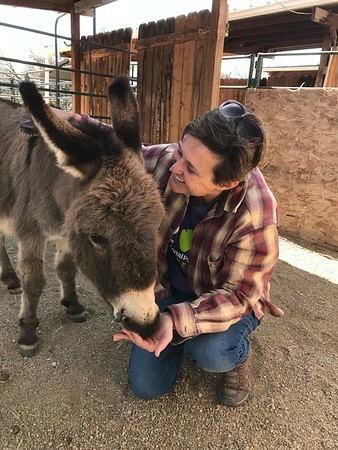 But Linda's favorite thing was volunteering at the Forever Home Donkey Rescue nearby. 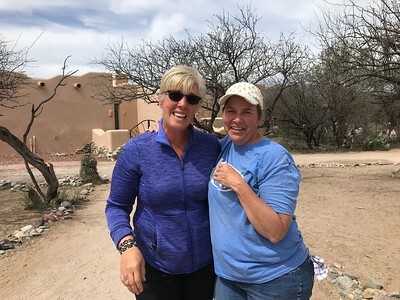 She got to where she was going out to help brush and socialize the donkeys four or five days a week. 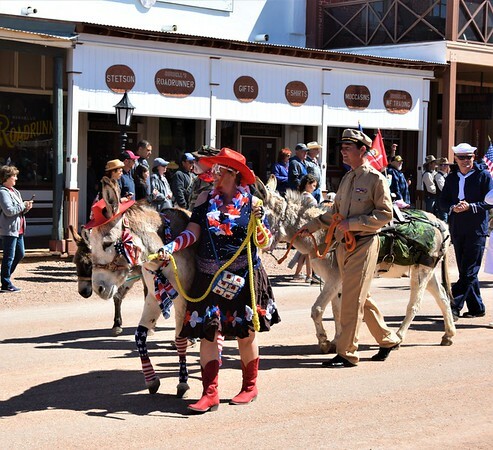 And, in March, she participating in the Wild West Days "Salute to the Troops" parade in Tombstone, helping walk donkeys for the Rescue. Her she is all dressed up and walking Friolita. 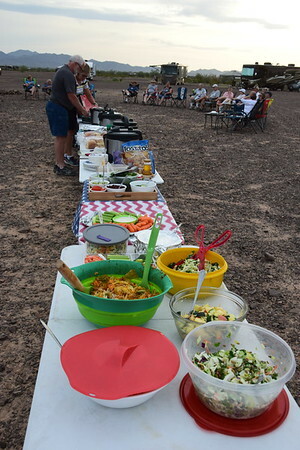 The Rescue won first place for their tribute, and one day we celebrated out at the Rescue with a pitch-in lunch. It was my first visit, and I got to "meet" the donkeys. 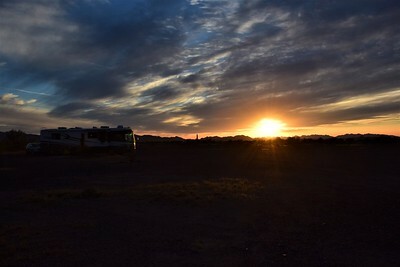 Just before our time ended in Benson, Lee & Tracy (Camper Chronicles) came to visit us for a couple days. Linda took Tracy out to the Donkey Rescue and Tracy took lots of photos and wrote about the experience - First Time At A Donkey Rescue. 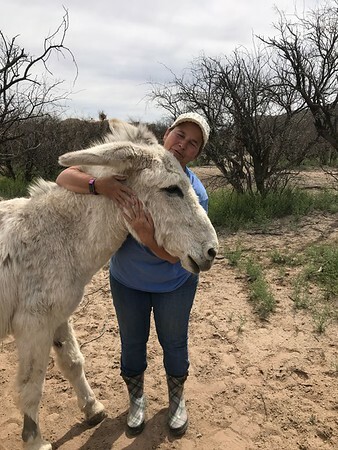 It was Linda's last day volunteering there, and she reluctantly said goodbye to "her" donkeys. 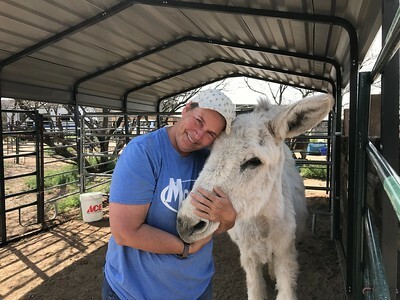 Tracy also got a little donkey love while she was there. And Linda also said "see you later" to her newest best friend, Suzanne, with tears in her eyes. Suzanne promised to send donkey updates often. 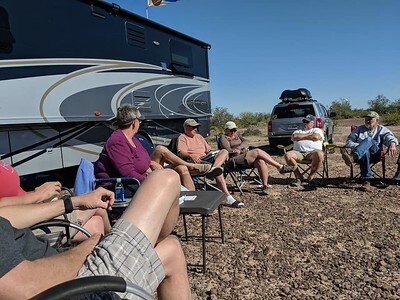 When our time was up, we said goodbye to our friends at Butterfield RV Resort in Benson, AZ and we headed to Quartzsite, AZ for our 2019 Boondocking Rally. 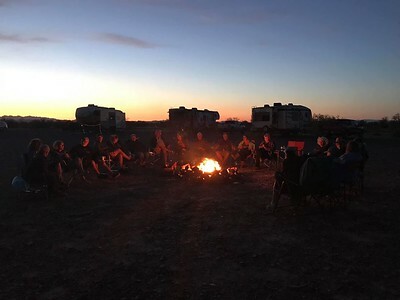 From March 22 - 31, we boondocked out in the desert in the 14-day free camping BLM land, and a week of that was spent putting on our Boondocking Rally. 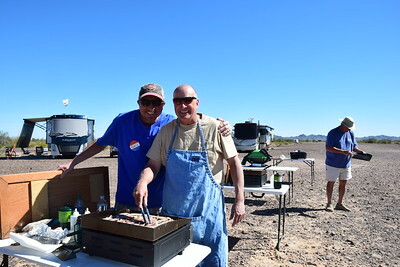 We had seminars, meals, campfires, and more as we enjoyed the company of our fellow RV enthusiasts. 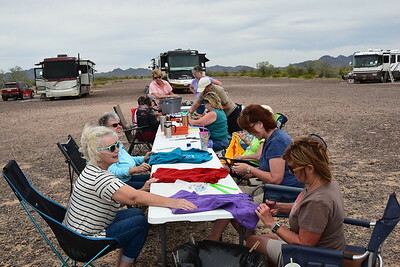 Details are included in this post - 2019 RV-Dreams Boondocking Rally. 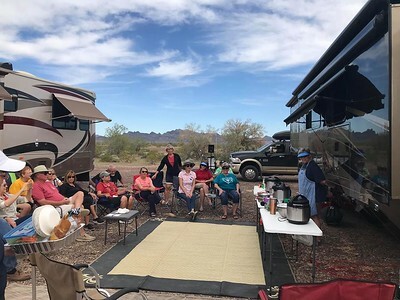 On April 1, from Quartzsite, we made a beeline to Pahrump, Nevada and Nevada Treasure RV Resort, the site of our Spring Rally that ran from April 8 - 14. 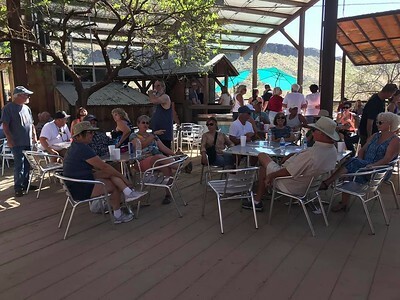 Nevada Treasure was under new ownership and management since our visit last year, and we arrived early to make sure everything was going to be in order. Fortunately, we noticed improvements with new managers Connie & Jerome. 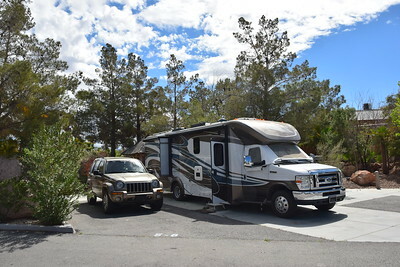 Now, Pahrump is where we sold our fifth wheel and truck a year ago and bought our Winnebago Aspect motorhome. We got a storage unit for our Rally supplies and other stuff that wouldn't fit in our 30-foot Class C, and now it was time to go through it. So, we emptied out the storage unit making three trips with the Jeep and we started sorting through everything. 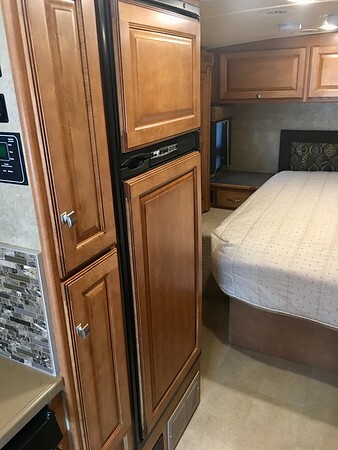 Here's a video of all the "stuff" that had fit in the fifth wheel and truck that we had to figure out what to do with. We threw away some things nobody would want, and we made a large donation to the local Goodwill. And we packed up 200 lbs of stuff we wanted to keep and shipped it to Linda's Mom in Florida. The bigger items we priced and basically had a bargain sale during the Rally. We sold two of our three inflatable boats at great prices and several other items went as well. Just cleaning out a small storage unit and getting rid of the stuff is tough when you are on the road. But we pared down, got our huge trunk storage area more organized and labeled our bins .... and we didn't add any weight. 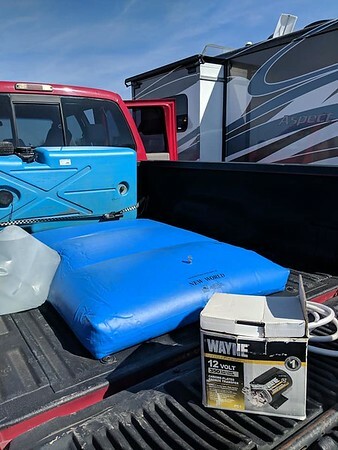 We did, however, get a RoofBag, to carry a few bulky items on the roof of our Jeep until we return to Florida and can put them in the attic of our rental property. By the weekend, we were ready for the Rally. 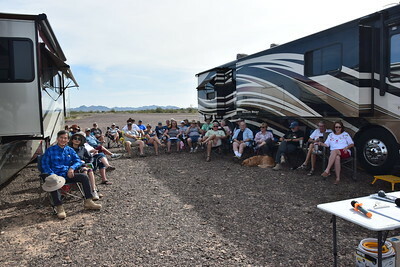 We had a little gathering at our site for the early arrivals the Sunday evening before the event officially started on Monday. It was our smallest Rally yet with about 40 people, but that made it more intimate, and we were able to get to know everyone better and remember all the names. Check-in was easy and after our welcome dinner on Monday night, Linda presided over our icebreaker to get all the attendees more acquainted. 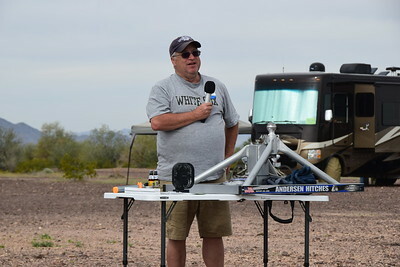 We also had Steve Kass of RV Weigh on hand to provide wheel-by-wheel RV weighing for our attendees. Thanks so much to all of our partners for their generous donations. After a great week of education, food, fun, and friendship, we ended the week with a poolside party complete with tiki bar. 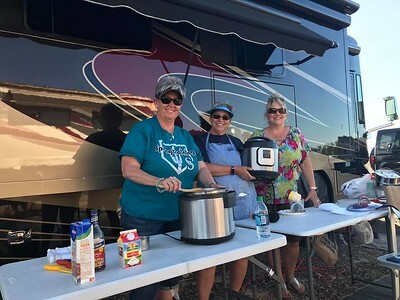 Another successful RV-Dreams Rally in the books. 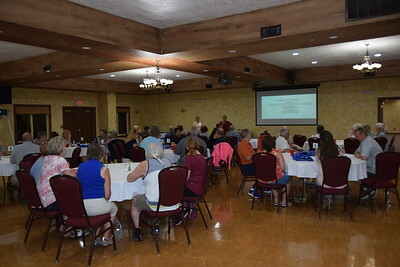 Our next Educational Rally is April 20 - 26, 2020 in Sevierville, Tennessee, and we hope to get registration open for that one very soon. 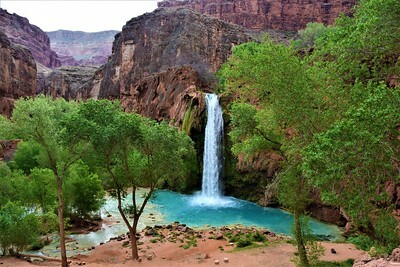 A few weeks ago, I posted information about my desire to see Havasu Falls on the Havasupai Indian Reservation after I saw a photo of it many, many years ago. However, since that time, it has gotten extremely popular, access has been restricted, and it has become very expensive. 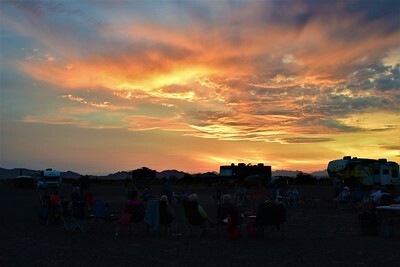 You have to have a permit to go, and you now have to pay for three nights of tent camping at $100 per night per person ($125 for Friday - Sunday). Permits go on sale on February 1 for the whole year and the system isn't adequate for all those trying to get booked. I tried, and the system kept kicking me out. However, they have a cancellation/transfer system, and I logged in to see if I could snag a permit for the week after the Rally. I was able to get one for April 15, the Monday immediately after the Spring Rally, so I booked it. For more information on permits, rules, etc. 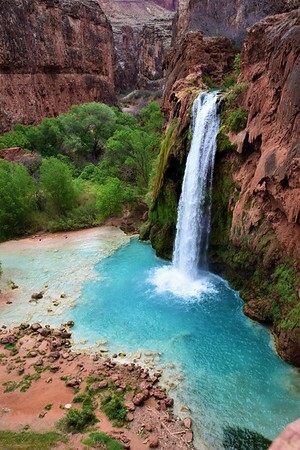 go to the Havasupai Reservations site. 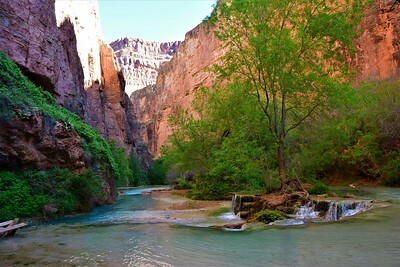 We left Pahrump on April 14, and made the 225-mile trip to Grand Canyon Caverns where we booked a water/electric site for five nights. Linda would hang out while I made the 4-day, 3-night backpacking trip. 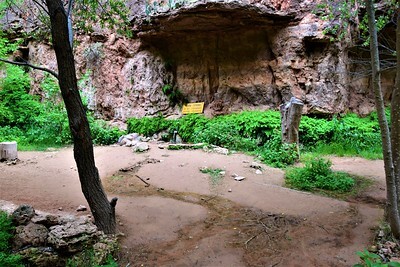 Grand Canyon Caverns is a cheesy, retro tourist stop on Route 66 between Seligman and Kingman, AZ. 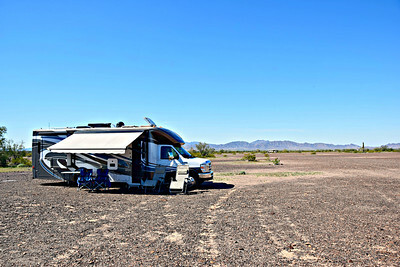 It's the closest RV camping to the Hualapai Hilltop which serves as the trailhead for the hike in. 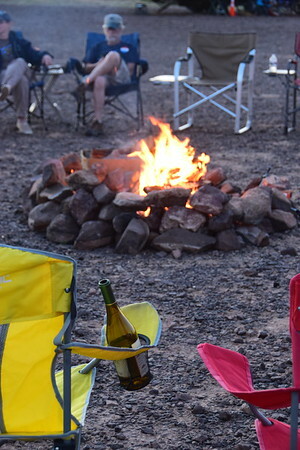 It's overpriced for camping, but for our purposes, it was the best option. 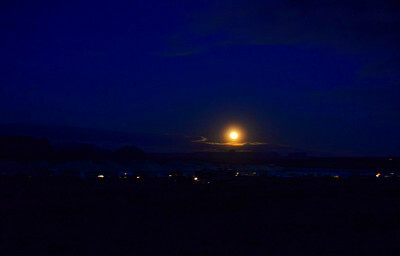 Although it is the closest, it was still a 60-mile drive for Linda to drop me off. On Monday morning, Linda took me to the trailhead. 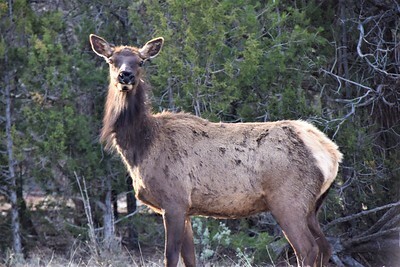 We encountered some elk on the drive. The parking area was full and people were parking up to a mile away from the Hilltop. 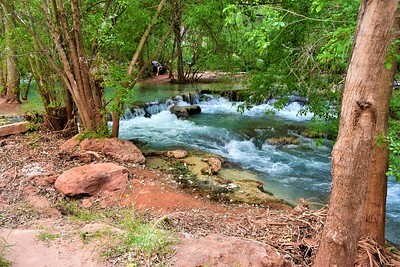 By 8:00 a.m., I was ready for my 10-mile hike to the Havasupai camping area along Havasu Creek. 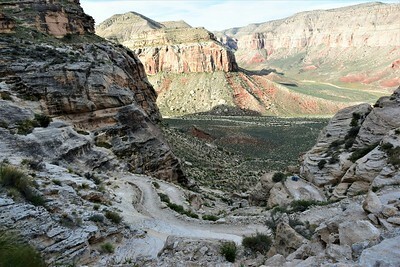 The hike starts off with a series of steep switchbacks to drop to the canyon floor. I was dreading coming back up those a few days later. 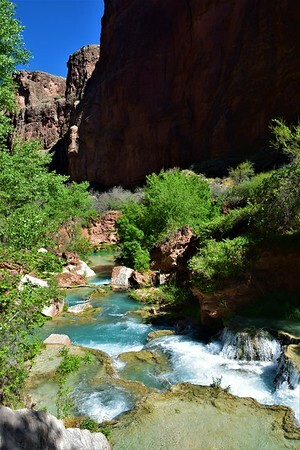 The hike itself is beautiful in its own right, and I'm just posting a couple of photos to give you an idea. 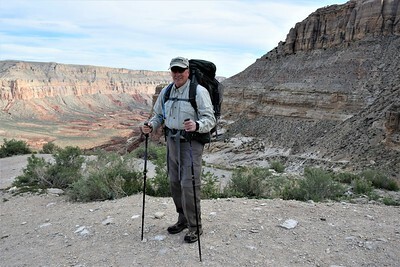 Eight miles in, I reached Supai village where there are prohibitions against taking photos of the community, the people/children, the pack animals, and the packers. 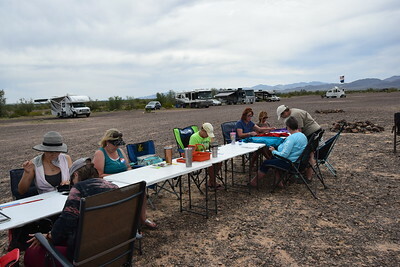 The village is where you have to check in with your reservation and a photo ID to confirm you are the person on the reservation. If you're not, you hike eight miles back out. They put a wristband on each person and you are given a tag for your tent identifying the dates of your stay, last name, and how many people in the party. After checking in, it's another two miles to the campground. 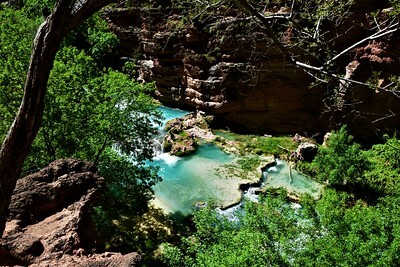 But, about a mile and half from the village, there is the first of many gorgeous sights on the left. 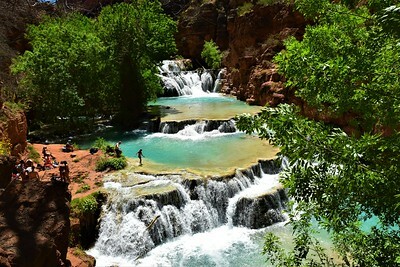 The waterfall at this oasis is known as Lower Navajo Falls or Rock Falls. Continuing on, the trail continued to descend. 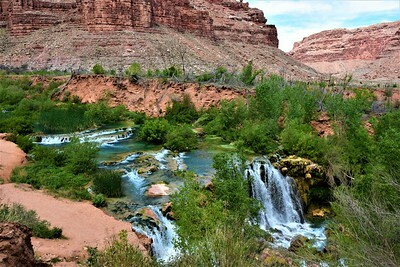 I started down a steep slope past a fry bread stand, and there to my right was the now famous Havasu Falls. I was staring in awe at what I had only seen in photographs that I was sure had been doctored. Nope, it really does look like that. After taking several photos, I pulled myself away and slowly hiked down the hill toward the camping area. 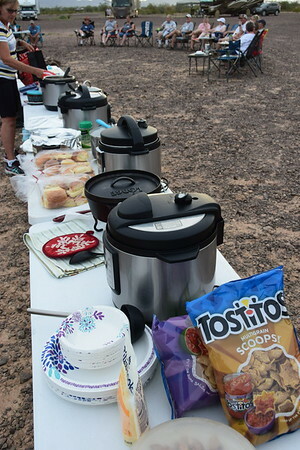 The camping area is about a mile long between mile 9 and mile 10 on the hike. 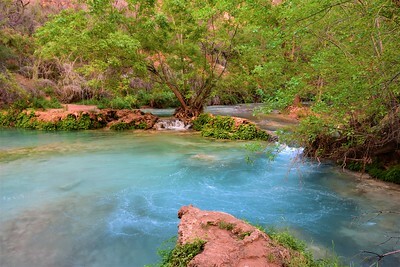 You camp anywhere in that section, but most of the sites along the Havasu Creek are taken. And people are camped everywhere. 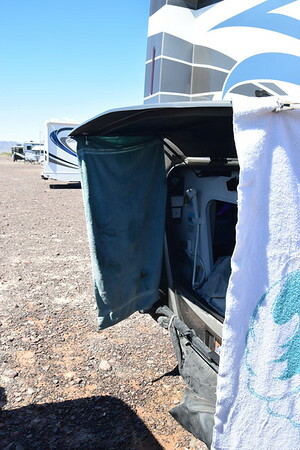 Don't expect to have much privacy as there are very few spots where people aren't having to walk right next to your tent to get to their tent, a bathroom, etc. 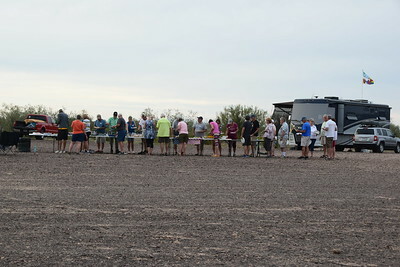 and most of the campsites, surprisingly, have picnic tables. 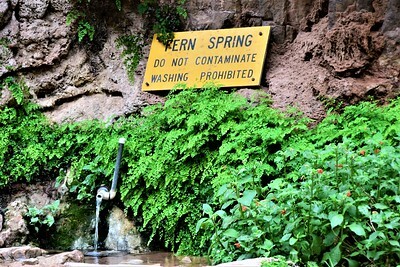 Also, though you can get water from the creek and boil it, treat it, or filter it, there is a spring where you can get water you don't have treat. 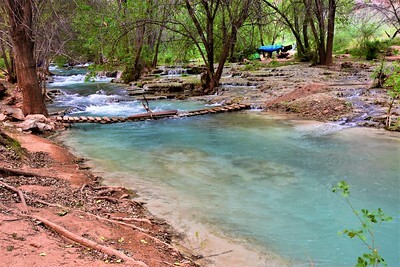 It is, however, near the beginning of the camping area, so the farther downstream you camp, the farther you have to walk to get water. and found a site by itself, but it didn't have a picnic table. 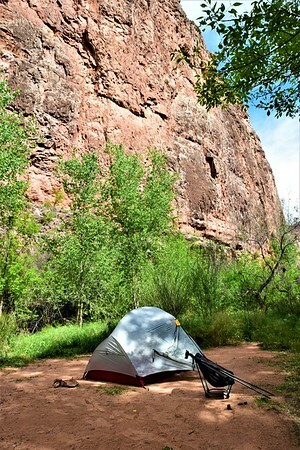 I was worn out, but set upon the duty of setting up my tent between the creek and the high red rock walls. 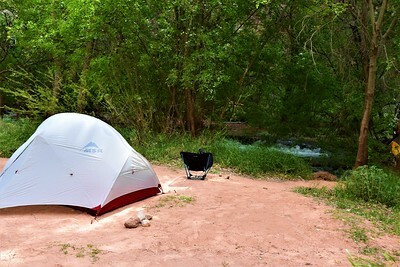 After getting settled, I walked down past the end of the campground which terminates at the top of Mooney Falls which drops 200 feet into the canyon below. I explored around the top of the falls, but didn't attempt to do the steep, difficult climb down the cliff to get to the bottom of the falls. I saved that for another day as I wasn't ready after my 10-mile hike to deal with the two tunnels, carved steps, chains, ladders, and slippery conditions. Here's a look at what part of that looked like. That was enough walking around for the first day. I went back to my campsite and soaked my feet in the refreshing water for a while before preparing my dinner and calling it a night. On my second day clouds and rain were forecasted, so I didn't plan too much. 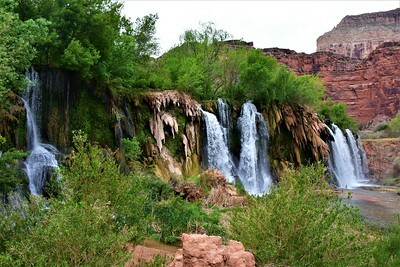 I got up early and hiked a mile and a half back uphill to Lower Navajo Falls and its little oasis which I had to myself. 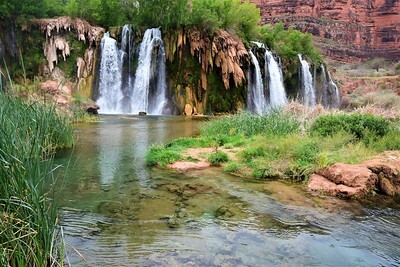 A short walk upstream from there is Fifty Foot Falls (aka Upper Navajo Falls). 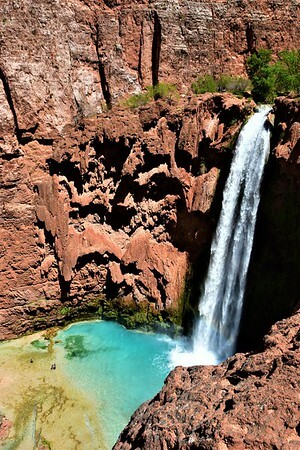 These falls are more hidden and get less traffic, but they are certainly worth visiting. After having those falls to myself for quite some time, I headed back down the trail. 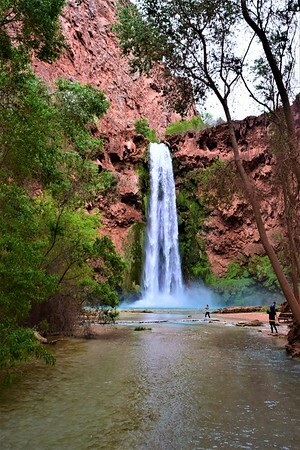 By accident, I learned that I had just a bit of cell service (Verizon) at the top of Havasu Falls. 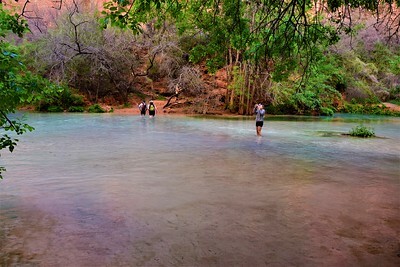 At least I could text Linda and check in letting her know I was okay, without hiking all the way back to Supai village to use the WiFi there. Unbelievably, there were no people around the foot of the falls, and I got several pictures without humans as part of the landscape. Sun, clouds, it doesn't matter. It's stunning. 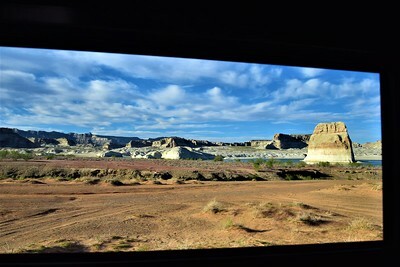 With the capacity in the campground for around 350 people, I was pleasantly surprised to be able to spend the morning having all this scenery to myself. 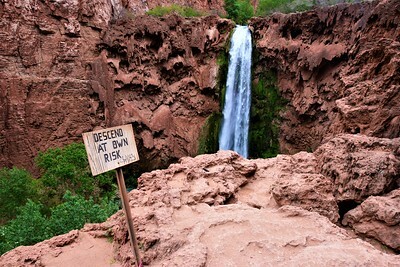 I walked the mile back down to Mooney Falls where I decided to climb down the cliff to see what it was like. My plan was to hike two miles downstream to Beaver Falls on the next day, and that would require descending the wall, so today was practice. By the sign above, there is a tunnel to the right, and then another tunnel right after that. The views of the falls from the tunnel exits are pretty cool. Pretty much anybody can get through the tunnels and take in the view, but after the second tunnel the descent gets dicey. This is where I saw a few people decide it wasn't worth the risk. Without the system of chains, there is no way I would have attempted it. One rock climber said it's "sketchy". 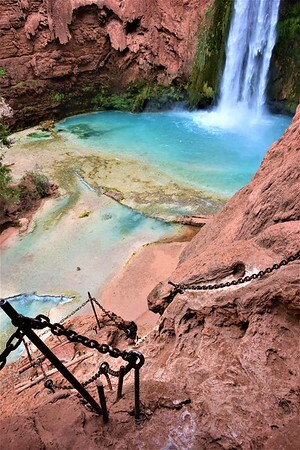 The rocks are slick where so many people have stepped in the footholds, and it gets more slippery down lower where the mist from the falls keeps everything wet. But I took my time and made it down safely. I took a couple more photos from the bottom. I climbed back up which was easier than coming down, but care was still necessary. After that, it started raining and rained for about three hours where I rested and read my Kindle in the tent. 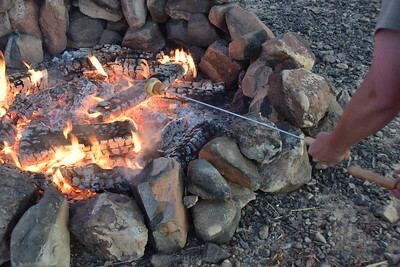 It quit long enough for me to cook my dinner, and then I was back in the tent the rest of the night. 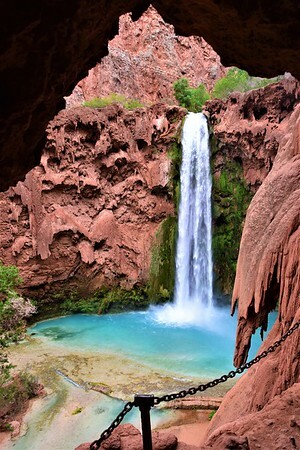 The next morning, I headed out around 8:00 a.m., climbed down the Mooney Falls cliff, and started hiking along Havasu Creek. Just beautiful. There were three river crossings along the way, and this was the first. I'm only posting a few of the photos from this lovely hike to Beaver Falls. 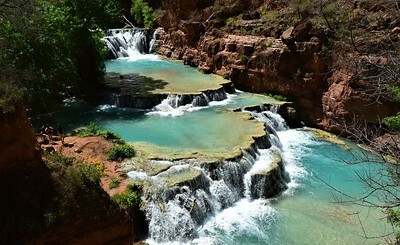 Eventually, I made it to the amazing Beaver Falls. 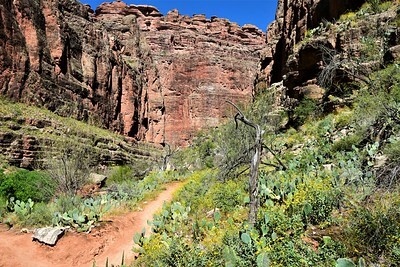 After hanging out there awhile, I headed back before the sun sank below the top of the canyon walls. 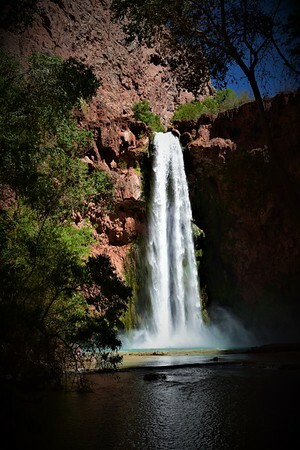 By the time I got back, Mooney Falls was spotlighted by the remaining sunlight. 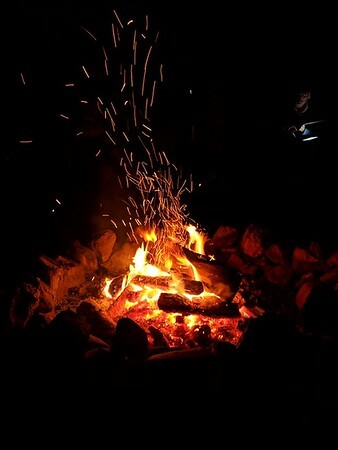 I climbed back up the cliff, walked to the spring to fill my water containers, and went back to my campsite where I relaxed, read, cooked dinner and called it a night. What an absolutely fabulous place. It wasn't easy to get here and it has become really expensive, but it was worth every minute to get my permit, every step to make it happen, and every dollar spent. It was an experience of a lifetime. On my last day, I hooked up with a couple in their 50s (there were very few of us over 50) as they were hiking out. 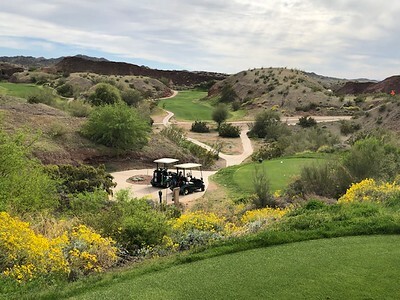 I tagged along with them at a strong pace and we made it the ten miles back to Hualapai Hilltop in about five hours, with the last mile up the steep switchbacks being brutal. The total elevation gain is about 2,400 feet with half of that being in the last mile and a half. Also, they were kind enough to drop me off at Grand Canyon Caverns so that Linda wouldn't have to make the 120-mile roundtrip to pick me up. They were just two of the many wonderful people I met over the four days making the trip even more enjoyable. 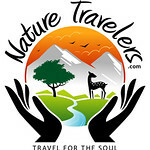 Note: I will do a more complete write-up with a LOT more photos on our NatureTravelers.com website. 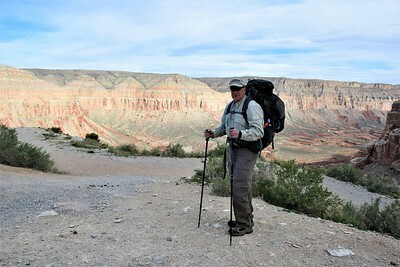 After cleaning and packing all my backpacking gear, we stayed the evening of April 18 at Grand Canyon Caverns. 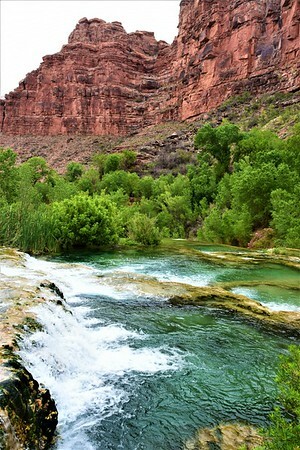 But then we left the next morning and headed to Page, Arizona. 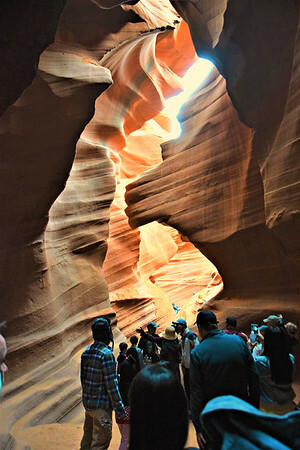 Our plan was to visit the increasingly famous Antelope Canyon before continuing north toward Canada. 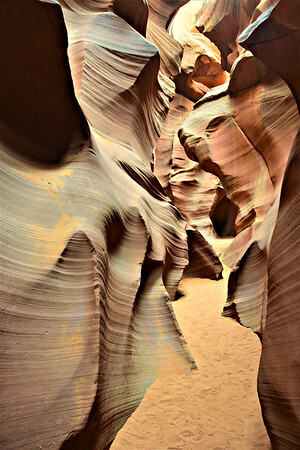 It was Friday, and along the way, I managed to snag two early Saturday morning tickets for the Lower Antelope Canyon tour with Dixie Ellis' Lower Antelope Canyon Tours. 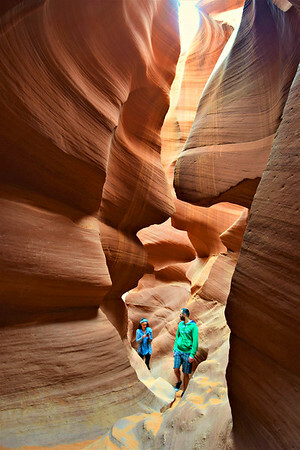 There are two separate canyon areas that are part of the same "wash" but miles apart - the Upper and the Lower - and they are both a little different. 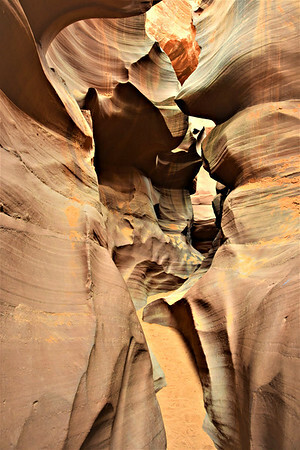 The Upper Canyon is more popular and is where many of the iconic photos of sunbeams shining into the colorful canyon are taken. It is, therefore, more expensive. 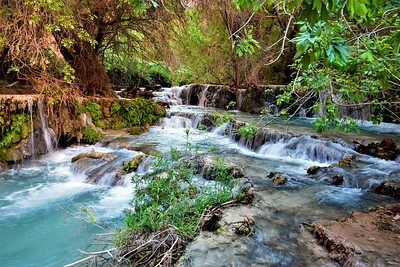 There are four tour operators authorized to guide there. 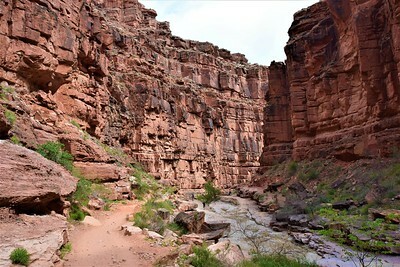 The Upper canyon is more open at the bottom along the trail and more closed in at the top. Tour operators drive you to the entrance and then it's a flat, easy 1/8 mile walk. You walk in to the end and then turn around and come back out against the flow of others coming in for a total 1/4 mile walk. 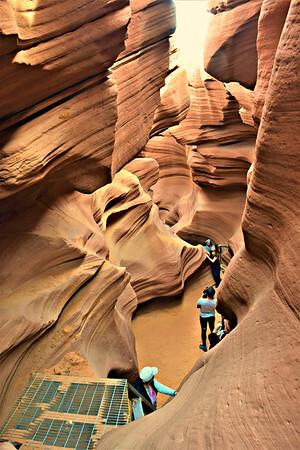 The Lower Canyon has two authorized tour operators and it is cheaper although many people like it better than the Upper. You walk a short way to the entrance. 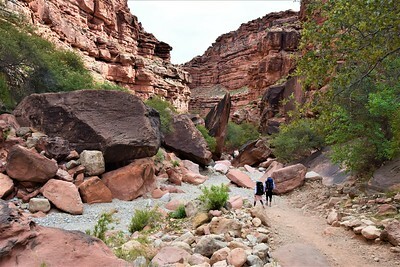 It's narrower on the trail and opens up at the top (the opposite of Upper), and it's a one-way hike meaning you enter on one end and then exit on the other. 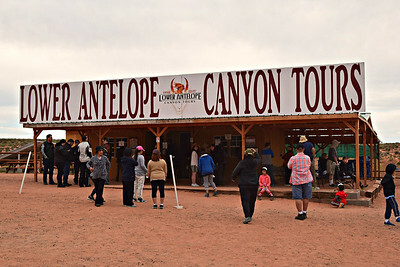 The canyon is 3/4 of a mile long, and with the walk to the entrance the total walk/hike is about a mile and you come out just below the tour company offices. 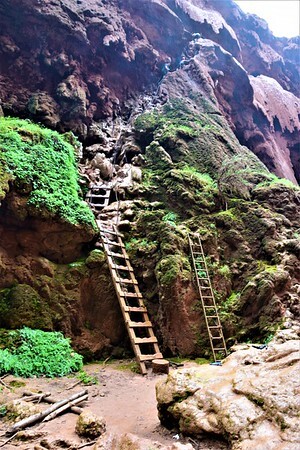 But it has many more steps, stairs, and ladders than the Upper. 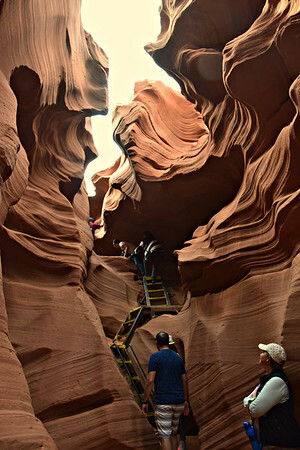 For links to all the authorized guides for Antelope Canyon and the various other attractions on Navajo land, go to the NavajoNationParks.org list of tour operators. 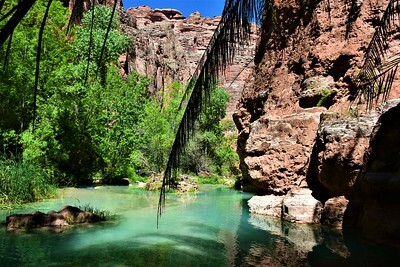 We were just lucky to get a last-minute spot, and we didn't really care which canyon. 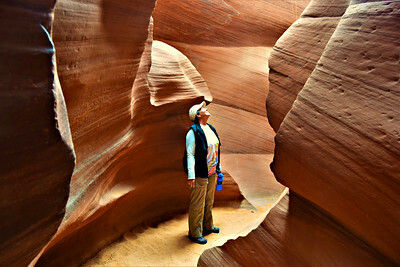 Linda just loves slot canyons and we've been wanting to check out Antelope for awhile. 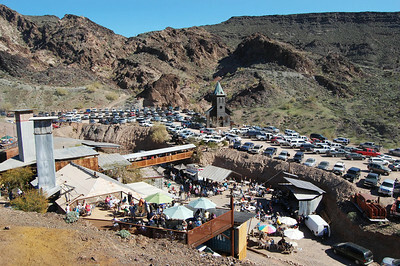 However, we're not into crowds and until now we had shied away from this overpriced (in my opinion) tourist attraction. 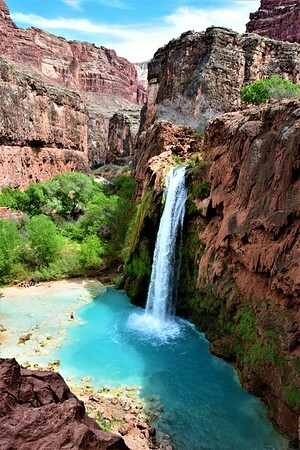 But that's what you have to put up with to visit this natural wonder. 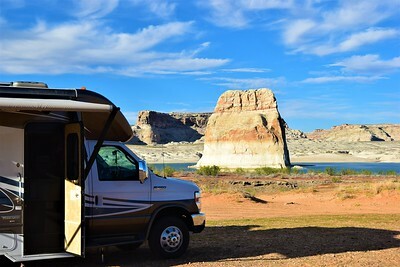 We actually drove by Page and over the Glen Canyon Dam and into Utah where we decided to boondock at the Lone Rock Beach camping area in the Glen Canyon National Recreation Area after our 240-mile drive. 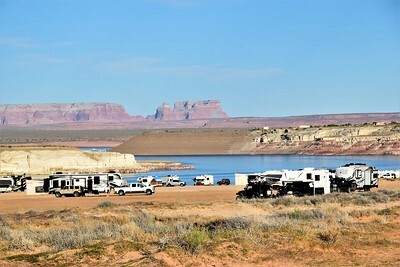 It's $14 per night and you can basically park anywhere on the beach of Lake Powell in this area. There is a dump station, a place to take on water, 4 micro-flush toilets & 6 vault toilets, and dumpsters. 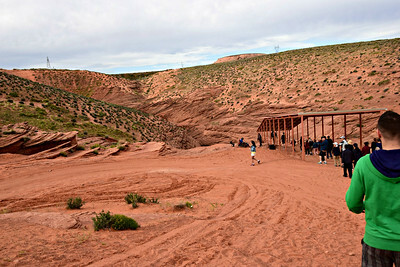 Oh, by the way, if you don't have a federal annual or senior pass, you have to pay the Glen Canyon entrance fee of $30. Our prior America The Beautiful Annual Parks Pass expired earlier this year, so we needed to get another one and were able to purchase it ($80) at the entrance kiosk to Lone Rock Beach. 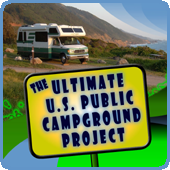 As we're both 55, we're still seven years away from being able to get a lifetime Senior Pass which also would get us 50% off camping at federal campgrounds (with some exceptions). The beachfront was already completely taken up by the time we arrived on Friday evening of this Easter Weekend. But we didn't really want to be there in the deeper sand anyway. So we parked up from the water's edge a bit on a pretty solid surface where it would be easy to get out the next day. We got set up and I took some photos. 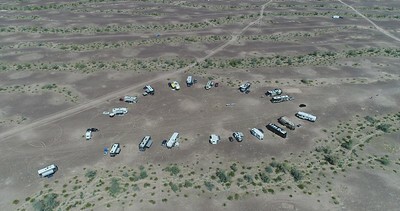 We were away from most of the other RVs. And though we weren't on the edge of the lake, we still had this pretty nice view from our bedroom window. Our friends Guy & Sue were also here as we just happened to learn after we arrived. 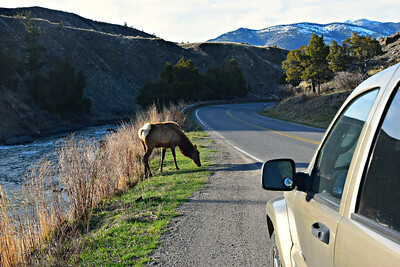 So, they drove over and we chatted a bit as the sun was going down. It had been since 2015 since we had seen them, and it was great to hook up with them even though it was very brief. and they departed shortly thereafter. After they left, we called it a night as we had to get up early for our tour the next day. 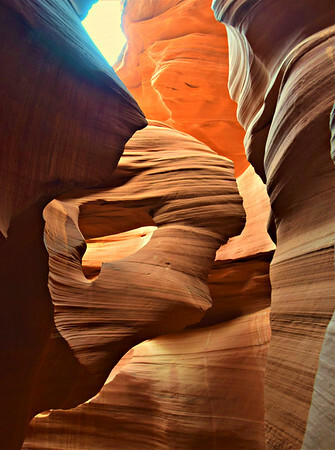 On Saturday, our Lower Antelope Canyon Tour was scheduled for 7:45 a.m. and we were supposed to arrive a half an hour early. We barely made it, but we got checked in and got in line with all the others with reservations for that time. We got our actual tickets, and then they got everyone with a 7:45 tour time in a single file line. It looked like there at least 60 and perhaps as many as 80 people. They then divided us up into groups of ten and each group was assigned a guide. 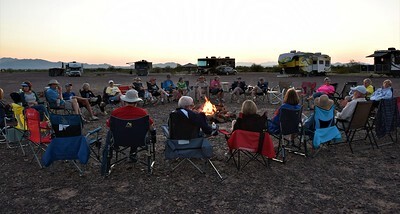 It seems all the tour operators take large groups and then divide them up into smaller groups of 10 - 12. There were some loud youngters in line behind us with one yelling "This better be worth it after waiting so long", so I quietly whispered to the young lady forming the smaller groups "Please put us in an adults only group". She smiled and obliged. After reading the long list of rules on a sign - no purses, no bags, no backpacks, no selfie sticks, no tripods, no monopods, no Go Pros, no video taking, etc., - all the groups walked with their guides to the entrance. 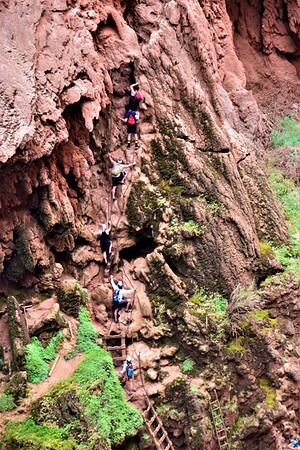 After more instruction, everyone went down the stairs to enter the canyon. In the beginning section, everyone was still pretty much together as the guides gave suggestions on the best settings for photos for cameras and the different types of phones. After that, the groups of 10 spread out just enough so that each group was not pushing the group in front of them and not being pushed by the group behind. There wasn't much distance between the groups in the canyon, but because of the twists and turns, we often could not see the people in the other groups when we stopped to take photos. 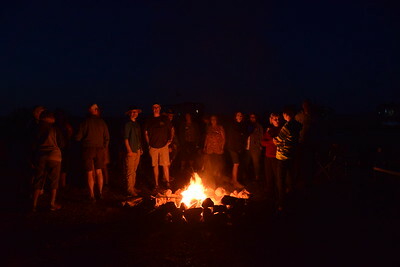 The guides also took photos of all the guests in pre-determined spots. Where I would normally be hanging at the back taking pictures, I quickly learned it was better to be at the front of our little group to get photos without people in them. But sometimes it was better to have a couple people in the pictures to provide perspective and a little color. This was a rare moment when only Linda was in the frame, and she had a big smile while admiring the beauty. I had low expectations of my photo opportunities, but I was actually able to get better shots than I thought. But it wasn't easy to stay just ahead of our little pack. This shot looking up - the Seahorse - was taken by our guide and it was taken by every guide on every tour. Nearing the end of our little walk, I took these photos. And then we popped out of this little slit in the earth. Linda was looking for a hand, but I was busy getting the picture of her usual tongue-out-while-concentrating face. From there, we made the short walk back to the parking area, and that was it. 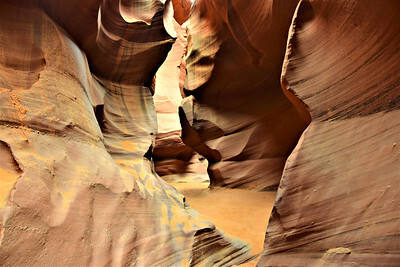 The Lower Antelope Canyon is really cool and worth visiting. But we were quite underwhelmed by the tour. While it is organized, it is designed to push as many people through as possible in a relatively short time and it provides what I would call a barely acceptable experience for $50 a person. Plus our guide was goofy and just not very good. 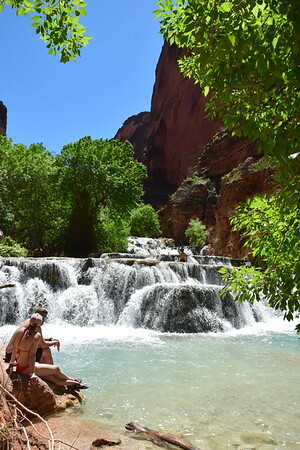 Even with a better guide, it's still not worth $100 a couple, and in my opinion a fairer price would be around $15 - $20 per person, but they are usually sold out, so supply and demand rules and more power to the Navajo Nation. 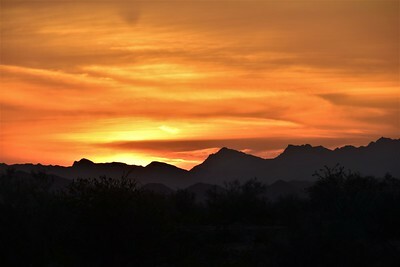 By the way, the Upper Canyon runs $58 (worst times of the day) to $78 (best times of the day when the sunbeams shine in) per person. 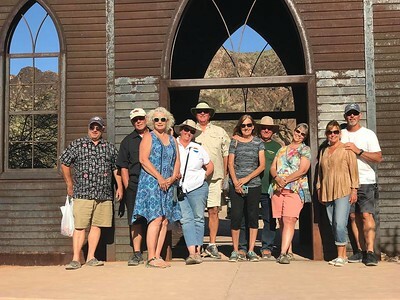 An alternative is to take a "photographer's tour", where there are smaller groups, you can take some equipment, and go at a slower pace, but they are much more expensive, and it's up to you to determine if that would be worth the extra cost. 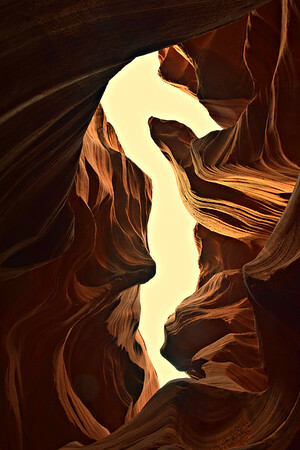 In the end, if you want to experience these wonderful canyons, you don't have much choice. You have to pay the price, deal with the crowds, and do it at the pace they tell you. It is worth it? Most people would say "Definitely", but we're on the fence. 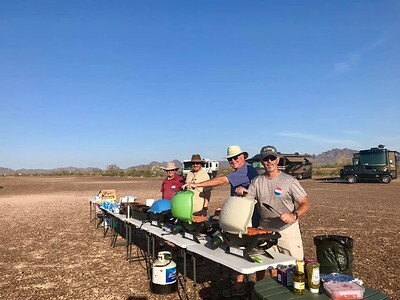 I'm glad we did it, but we've experienced a lot of places in our time as full-time RVers that are equally or more impressive without the crowds, the "hustle you through" approach, and the costs. 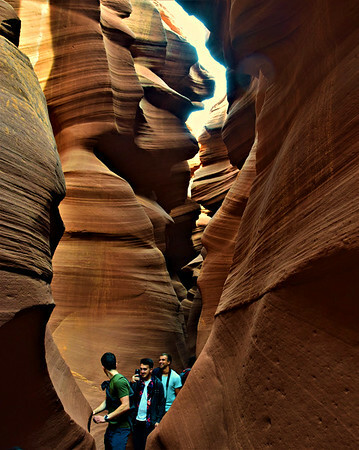 Years from now, will we include Antelope Canyon as one of the highlights of our lives? Probably not. 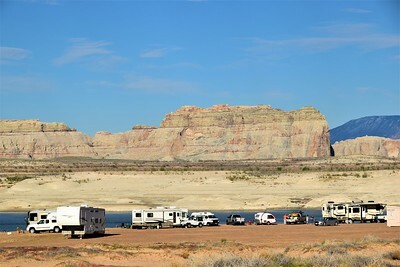 After leaving we picked up the RV at Lone Rock, and headed west toward Kanab on U.S. 89. 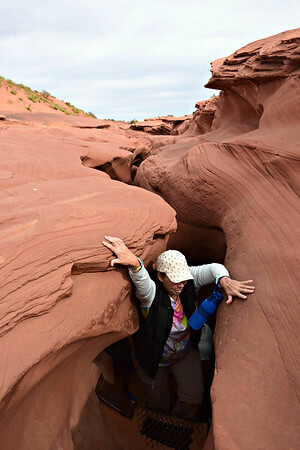 We went past The Toadstools trail which we had done before (worth the walk) and past House Rock Road which leads to the "permit only" North Coyote Buttes (aka "The Wave). 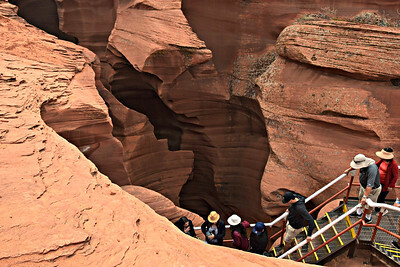 Only 20 people per day are allowed into that wilderness area, and 10 are chosen in an online lottery and 10 are chosen during an in-person lottery drawing at the Grand Staircase Escalante National Monument Visitor Center in Kanab. The in-person lottery is for the next day. We were fortunate to get two spots at the in-person lottery back in 2013 and that is one of our life highlights. 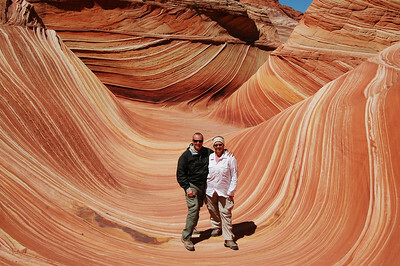 Permits are hard to get, but this web page tells you the process for trying - Coyote Buttes - Bureau of Land Management. In Kanab, we turned north staying on U.S. 89 until it ran into I-70. 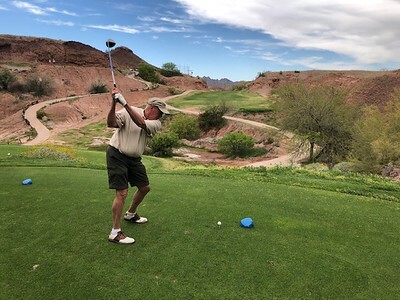 Having also visited Zion National Park and Bryce Canyon National Park and spending extended time at both in 2013, we by-passed those turn-offs along the way and eventually headed west on I-70 to intersect with I-15. We drove north to Fillmore, Utah where I had pre-scouted a Chevron station with overnight parking in the back. 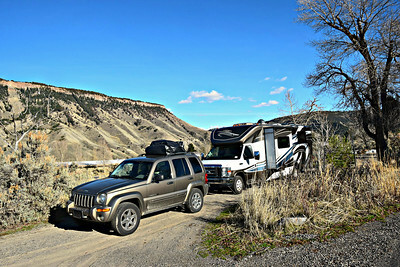 After our 250-mile drive, we settled down there with another motorhome, and big trucks eventually surrounded us. 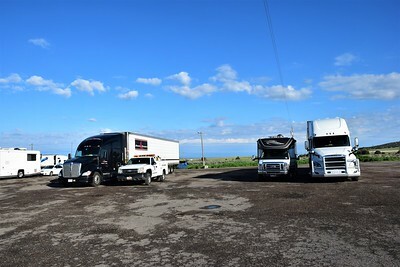 The trucks ran all night and they were loud but we just considered it white noise. I took photos the next morning after our neighbor on our door side had pulled out. It wasn't ideal, but it was free, nobody bothered us, and we did have a mountain view. We got a reasonably early start on Easter Sunday and continued north on I-15 through Provo and Salt Lake City and on into Idaho. We had made arrangements to stop at a Boondocker's Welcome host in Blackfoot, ID north of Pocatello. Unfortunately, the temperature dropped and it started raining and we were unable to see the mountain ranges. We arrived in a pouring rain around 4:00 after our 330-mile drive. Our hosts showed us where to park behind one of their buildings. They had just graded and rocked the drive so it was solid and level. They also had a 50-amp electric hook-up for us, so I dug out my adapter and we had electricity. We were their first guests of the season, and they were still having freezing temperatures, so they have a water hook-up but it wasn't turned on yet. With the cold and rain, we joined them in one of their huge outbuildings, and chatted for awhile. 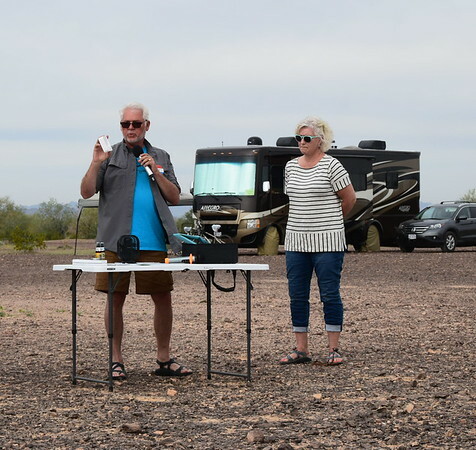 They have a 43-foot Monaco Signature Series motorhome, and they plan to increase their traveling significantly in a couple years. 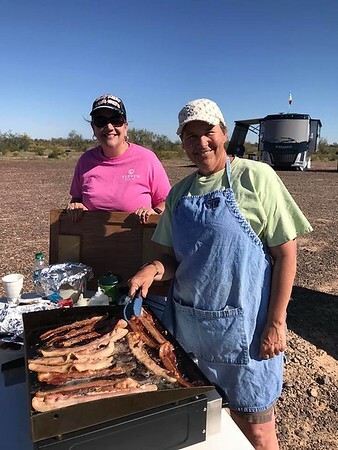 They were tired and had to go to work on Monday, so we went back to our rig where Linda threw together a little dinner. This morning, today, the sky started to clear and we had a view of the 8,800-foot Mount Putnam. Our hosts left early for work, and we eventually got moving around 11:00. Today is a relatively short drive up to the West Yellowstone area. 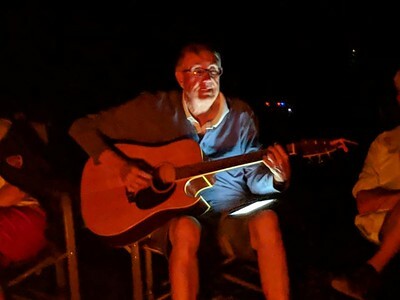 We had planned to meet up with Gary & Leesa as they are workamping there this summer, but snow had delayed their arrival and we'll miss them by a few days. The west entrance road into Yellowstone National Park opened this past Friday, so we'll be able to access the western and northern parts of the park. 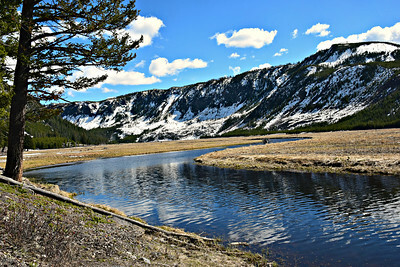 We'll take a couple days to see the park with some snow and look for early spring bears. 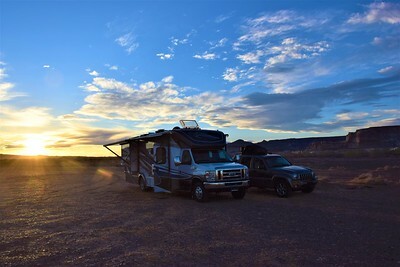 The RV parks and campgrounds aren't open yet, so we'll be doing some boondocking somewhere - we have a Plan A, B, & C. We'll let you know when we figure it out. So, that's what we've been up to the last month. It's been quite interesting. 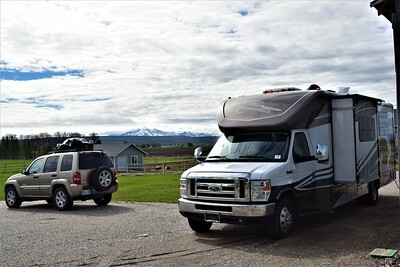 After we leave the West Yellowstone area, we're going to spend a few days in Great Falls, where we're having some packages shipped and getting a 30,000 mile service on the motorhome. Then, we'll cross over into Canada on April 28, as we make our way to Prince Rupert to board the Alaska Marine Highway Ferry on May 10. We're getting very, very excited.